Federico Rahola was born in Genova in 1966, he teaches Sociology of the Cultural Processes at the University of Genoa. This conversation between Federico Rahola and Luca Vitone for the press release has been asked by pinksummer. Their friendship, some juvenile and other individual experiences of their paths seemed useful to us to elude a mere aesthetic sphere. Nevertheless, staying in a cultural ambit, from the talk between Vitone and Rahola, the inadequacy, or even the absence, of a cultural politics in Genoa, comes out. Or better, we of pinksummer would add, it seems that here, more and more, politics has stopped carrying out its main task, which is to indicate the guiding lines, ending up corroding the autonomy of curators or directors of museums. The results of “centripicity” are not exactly good. We believe that producing culture is not just hosting events or series of lectures. It means transparency regarding the division of budgets and purposes, it means giving curators the possibility to create an agenda. We hope, by the way, that when Sandra Solimano ends her mandate, the next director of Villa Croce Municipal Museum of Contemporary Art of Genoa will come out from a public competition not exclusively reserved to internal officers of the Municipality of Genoa, and that he will have a renewable contract, but on-term. Many young Italian curators have to go abroad to work. They are well-informed professionals that can come out from the invisibility without having unreasonable budgets. Federico Rahola: I think that the main different between us, regarding Genoa, is that I undergo geography, while you choose it. For what I am concerned, coming back to Genoa has never really been a choice, but the consequence of a competition and a free home. I wasn’t thinking of coming back. Luca Vitone: Are you happy with this decision? How long have you been away? F.R: More or less ten years. L.V: Personally I have some qualms about the idea of coming back, having never received an invitation from a Genoese institution that obliged me to think about a return, I never thought of coming back. The idea of it seems to me like an interruption of a path. Coming back to Genoa, which I had left in 1984, seems to me from one side a return to some childhood confidences, I feel it like a turning back, a melancholic idea of abandonment of a research course. Nevertheless, the occasion of thinking of a solo show in Genoa after twenty years, and to present a work I had in mind from a long time, is in fact the sublimation of a return. The project is a portrait of the city that, despite the desire of distance, exerts on me a great attraction. For years I have been coming to Genoa only occasionally and always for a very short time. On the occasion of the exhibition Stundàio, in 2000, at Palazzo delle Esposizioni in Rome, I came back to Genoa with the idea of looking for, to examine it in an attempt of re-appropriation. Among the works on exhibit, there was also an itinerary that reached the homes of eminent Genoese people that, throughout the centuries, without forgetting it, had left the city to live in Rome. F.R: I thought that Stundàu was another kind of work, an overlapping of mapping, I had thought of a projection of names and streets of Genoa on a map of Rome, like Canneto over Via Margutta and viceversa. L.V: I had the intention to make a work on a place, anyone, to show its peculiar aspects, but at the end I chose Genoa because, knowing it well, I felt more confident in showing its characteristics and common places, like its meanness, or, if you prefer, parsimony, the past glory, the narrow streets, the creuze and the music. A polyphonic music a cappella for five voices that is called trallallero. That was in 2000, at that time I never spent more than two or three days in a row in the city. Leo, my son, was not born yet. On that occasion I spent in Genoa a few weeks, I wanted to see it again and understand which images excerpt for that exhibition project. Stundàu is a Genoese word that I found in an interview to Montale, a word that condenses inside it different shades of what could be called the attitude of the Genoese: a constant uncertainty that induces him to become presumptuous towards the world and that becomes frustration because the other does not see it, he does not know. This presumption is a sort of internal illusion that brings the grumbling, the mugugno (“Behaviour typical of pride and shyness mixed with suspiciousness. The daily practice of mugugno, a certain complex of inferiority towards the other, balanced with a sense of moral superiority”). Genoa is slow as Piovene writes. Towards the contemporary, the new, the future. It is hesitant, after all future itself cannot be a certainty. They are all truisms that reflect Genoa in the public imagery. Villa Croce is a museum since 1986, but nobody really knows much about it if there isn’t a relationship with the city; Gamec in Bergamo is much more visible, although Bergamo is a much smaller city than Genoa and with a less influent cultural and economic history. Slowness, in this case, becomes invisibleness. F.R: Genoa is an example of enclave: from the outside people think at it as much smaller than it actually is, so when you say how many inhabitants it has, people do not believe it, it is perceived as Perugia and for sure smaller than Bologna. Of course it is not the same from the inside. But it is a city projected on a recent past, a past that always seems more lively than the present, in the ‘80s it was hard, with a dismantled industry, heroin. From the ‘90s many things have changed. Now it is felt like a beautiful and anachronistic city: “I love Genoa, I saw it briefly while taking the ferry”. There has been the movie by Winterbottom where it seemed to be in Marrakech. In 2010 Genoa is a discovery: 500 years after Columbus, Genoa becomes a beautiful city, a city to discover. 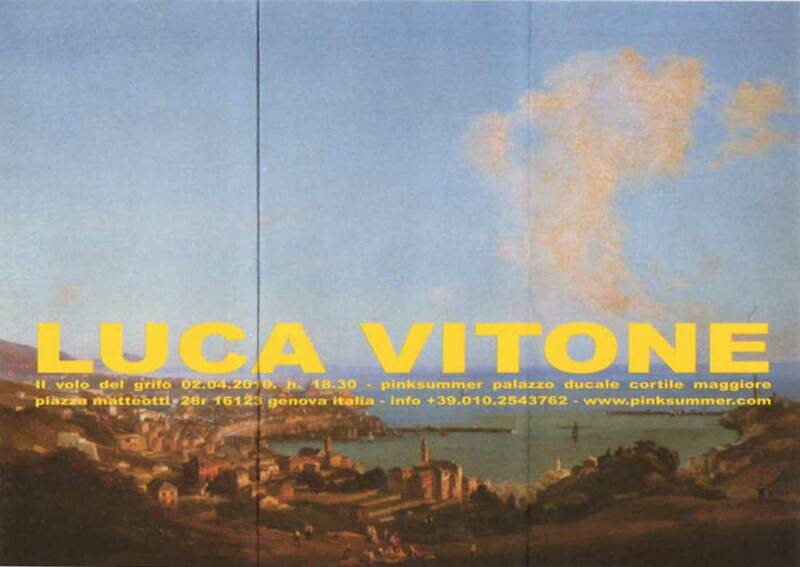 L.V: Genoa has had topic moments without ever forming a system, events keep staying apart from each other like islands, it is a very individualistic, oligarchic city: built by powerful families that never wanted to create a public place to represent the city. There is Palazzo Ducale, but it has never been meant for it to really represent the city. Also today, as a cultural centre, there is the feeling it does not follow an agenda. F.R: Is it just this that Genoa lacks? L.V: I see this because this is my sphere. F.R: There are things happening, the city is quite vital. L.V: Talking again about Bergamo, Cresci re-launched the Academy of Fine Arts with Vettese, Di Pietrantonio, Arienti, Piccolo, Daneri, Pioselli, Cavenago, Paci among others, also regarding this Genoa languishes. Good that from a few years there is Cesare (Viel), Fiorato, Benvenuto. Academies are good spies of the dynamicity of a city. Not by chance, some young artists that studied in Bergamo now start to be well known, I am thinking of Giovanni Oberti, Meris Angioletti, Luca Resta. F.R:I was thinking at how the city was at the end of the Eighties. There have been moments when you and I have lived the last trickles, not the upward time. I remember the social centre Officina and the friends we used to hang out with there, those that soon would have left the city. A Diaspora. But, besides that centrifugal force, Genoa also has a centripetal history: what counts is what happens inside, not outside. L.V: Regarding the individualism, it is possible to assume that Genoa is a ante litteram model. No civic representative place has been built, except for the religious one that was there before. On the contrary, in Milan, where the public place once had an important role, now everybody just thinks of its own interest, projects of public spaces systematically decay in the continuous postponement of their opening: The Fashion Museum, The Design Museum, the Museum of the Present, the Museum of Novecento. Everything is translated into an extreme delay compared to Europe, and the imagine of the city is always rescaled. Genoa, in this sense, is an unaware model that taught how not to lead a city. This looking inside its walls that generates invisibility. In Milan there is a discussion of projects that later decay, in Genoa there is no discussion of projects. F.R: It’s this invisibility that makes it an exotic place, at least in Northern Italy. But, if Palermo is overexposed, the exoticism of Genoa comes from the fact it is unknown. Moreover, Genoa is exotic also because it has a strong migration presence in its centre, the historical centre, while in Milan as well as in the other cities, immigrants are shunted to the suburbs. The historical centre of Genoa has little to do with the other cities in the North, except Turin perhaps, and people that live in it are not the one you would expect to find. Winterbottom, with a look from the very outside, sees it as a city of Maghreb. L.V: In the ‘70s, in the cinematographic and televisional imaginary, the historical centre of Genoa was that of a gloomy place, devoted to illegality. I remember a movie by Zinnemann (“The Day of the Jackal”), in which a killer who had to make an attempt on Charles de Gaulle’s life arrives in Genoa and buys fake documents and a smuggled weapon in Sotto Ripa. The archway is for its nature a borderline, collusive environment. F.R: Another peculiarity of Genoese people is a geographical hypersensitivity towards the city, an obsessive attention to any insignificant change. Genoese people do not accept an imagine that is not iconographical correct. Milan, for example, is inhabited by eight hundred people, but is mainly based on the ones that commute, the most of the population is diurnal, while unfortunately just who resides there rules. And it is anyway a iconoclast city. Here, if Carlo Felice Theater changes the shade of grey, Genoese people chain up. Since the ‘50s also Milan had a strong popular presence in the centre, in Brera and Navigli for instance, then, with the speculative wave, these areas have been progressively reclaimed from the working class presence. In the ‘80s also in Genoa there was the idea to re-project the historical centre, but luckily the project has bumped into some structural limits: many houses are dark at lower floors and therefore not attractive, this led to the possibility to live in the centre with equitable prices. The historical centre of Genoa has such peculiar characteristics that allows it to keep on being inhabited by the under class, and hardly will it be museificated. Think at Via Prè: although there was an investment on it, it will never be Boccadasse. So there has been the invention of the floating city, all fake, in front of the real one. Then, since the historical centre is very large, if an area gets revaluated, another one gets devalued, as it is happening in Via della Maddalena. It is like in the Amazonian Forest: you find your way through a machete, but nature grows again behind you as soon as you are passed. The history of the place prevails on any other speculative rationality. Let’s get back to your work about Genoa. L.V: As I was saying before, it is a portrait of the city, a video. An aerial image that starts from the West and goes until East. A vision of the fabric of the city seen from the sea, a long vision, that seems endless, that starts from Voltri to arrive to Nervi. A city laid down on the sea. Two parallel lines of the horizon: a boundary between the houses and the sea, underneath, and the line that separates the mountains on their back and that do not allow any urban expansion, the sky, over. A journey on the sea, for more than 20 km, a horizontal editing that rebuilds the structure of the city. Then it goes up on the hills, at the right of Monte Fasce, it goes inside a bare, inhabited surrounding, almost wild, mostly without trees, rocky with extended grass surfaces. A remote place just behind the city. There is a fifer playing, with a Ligurian pipe, a longing piece from the folk tradition, a poem to the city, something that does not anymore exist or that is not recognizable, something unpredictable. The video lasts 5 minutes and 27 seconds. There are two tracks: the helicopter and the pipe. It is longing as the idea of picturesque, it is part of a memory that doesn’t exist anymore, but that we would like to live again. It is a coming back to the place of a idealized childhood. F.R: Idealized, but not in a picturesque way: picturesque is going to Provence looking for the landscape of Cézanne’s paintings, it is when the image of something prevails on the thing itself. L.V: It is seeing places as we have imagined them. F.R: Putting on the place your idea of the place. Saudade, it is called in Rio de Janeiro. L.V: The video starts with the sound of the helicopter that later is replaced, fading with the sound of the fifer, the vibration of the blades gets lost on the mountainous outlines of the hinterland and comes back at the end to go on until the image gets dark. I was thinking at this work for a long time, about ten years, at the beginning I wanted to use a tongue twister as a dedication to the city. The pipe has come later when, with you (Pinksummer and Anna Daneri) we were thinking at the project I wanted to realize for the Plastic Gardens, and it is from there that I revised it. Throughout the years the work has changed: as I said before, at the beginning there wasn’t a fifer but a human voice, a tongue twister. It makes me think of the exhibition at Pinta (Genova, 1988), which was my very first solo show in a gallery, that was pervaded by a need of iconoclasm towards places. It was my first reflection on what the places that we inhabit are, the absence of roots; the photocopies I used in that show underlined the depersonalization of the place. I needed to make a tabula rasa, also linguistic, regarding the coloured emotion of the ‘80s. In the ‘90s we looked at Minimalism to get away from Salvo, Ontani, Cucchi, to stem their wave of colour. But my generation has been a fragile one. Then there were few opportunities, exhibitions, for how they were organized, today seem antique to us, there were no prizes, grants, or productions. The first institutional exhibition of our generation was in Prato in ’91, curated by Grazioli, with Martegani, Moro, Arienti, Catelani, De Lorenzo. Then, in ’94, there was the one in Rivoli curated by Pasini and Verzotti, and among others there were Moro, Arienti, Beecroft, Cattelan, Airò, Viel. At that time there wasn’t the same generational relationship of continuity, there wasn’t the continuity that there can be today between Luca Trevisani and me, we know and esteem each other. F.R: Maybe this also depends on the generational crushing, a sort of compression that exists also in other social spheres, I am thinking of the decreased distance between parents and children. L.V: Perhaps. It depends, I think, mostly on the fact that our generation has started to teach. Then, most of the teachers, those that were our professors, were just teachers and not working artists. The generations of Cucchi, Kounellis, Ontani, Clemente, Anselmo, never taught in academies, and when they did, it was never in Italy. Just Fabro in Milan. Because of bureaucratic reasons, and for an unhealthy management of didactics, academies, in the Eighties, had created a void. In the next decade, from Garutti on, many professionally visible artists have started to teach. Abroad, in the most important schools, this didactic role of the artists has never been interrupted, and it has promoted a generation of artists..
We are a generation of autodidacts. We have learnt on field how to prepare a show, how to present a work to a gallerist or to a curator, how to think a catalogue. You can look at the publications of those years to get an idea. In Italy, until the ‘70s, there was a number of institutions that worked well, and had relations on a European level, for example Palma Bucarelli in Rome, GAM in Bologna: institutions that were run in a similar way to the other European ones; then there has been an institutional breakdown. After the Beaubourg was born things have slightly improved, and we have lost time. Just during the last 15 years the situation has improved, with Turin as a centre for the contemporary and then MART, MADRE, Mambo, MAXXI, Ratti, Spinola Banna…Now we teach how to set up an exhibition, how to relate with galleries, curators, the production of the work, the assignors, and so now we can speak of a strategy of a system. We were raised in idealism, we thought the idea was enough. F.R: Yours/ours is not quite even identifiable as generations, but as small situations that have emerged; now is the attempt to institutionalize them. Anyway, I wanted to ask you a couple of things about the video. The first is about the fifer: what does the magic fifer takes away? And then, the tracking shot is horizontal, which has to be flattened through length, so it is a vision of Genoa which is only possible from outside, because it is impossible from the inside. It is possible to see Genoa in its length only from the sea, as if it were impossible to create a unitary narration from the inside, and so, maybe, its invisibility comes from this. L.V: I never thought about it, it’s true… and what is your reading of this? F.R: First of all Genoa is a urban invention of Fascism, and then there is a strong narcissism of differences, like if you are from Sampierdarena you say “I go to Genoa”, and not “to the centre”. This length is the only direction the city has got, a bowel of earth with two lines: the Aurelia and the Circonvallazione, and so when you are inside that bowel you don’t have the feeling that the city could be so long. It is a cartographical way of seeing the city, you always have narrow-gauged points. L.V: A cartographical representation that is difficult to recognize when you see it from the sea. I would say this work unconsciously leads back to my first exhibition at Pinta, when I had showed a planimetry in scale 1:1 of the gallery itself, on the floor. As I was saying before, it represented the lack of relationship between us and the place; its duplication underlined its loss. In this last work there is maybe the attempt to give back the image of the city, but in this sense this attempt fails because the place is still unrecognizable. I come back to the starting point. Genoa hides itself behind this musical instrument that is and is not there, a “magic” pipe, an unobtainable archaeological object of a dying species material culture. I don’t think a museum owns a copy of it. I have come to know the Ligurian pipe, or of the 4 provinces, through Tralallero and Stefano Valla in particular.